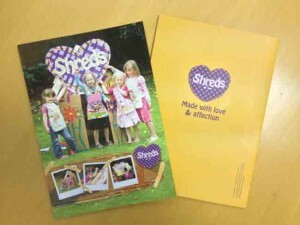 Not only did we impress our client by delivering the new Shreds Catalogue in 4 days earlier than expected. They were further impressed with the quality of production. Our client commented that they were amazed by the quality of print and how vibrant the colours appeared. The catalogue comprised of a 4pp Cover on 250gsm Silk and 48pp Text on 150gsm silk, printed in 4 colour process with a satin coat, perfect bound with matt laminate to the cover. “May I say a huge thank you, the brochure looks absolutely amazing, print quality is on the money and my client is chuffed to bits. Pass on my thanks to the whole team for their input, love and care on the job. I hope they keep up the great work on future orders”. We certainly intend to keep up the great work on ALL our work.